Blazon: A Hurt surmounted of an Arrow bend sinister-wise and a Long-bow pale-wise all Or. 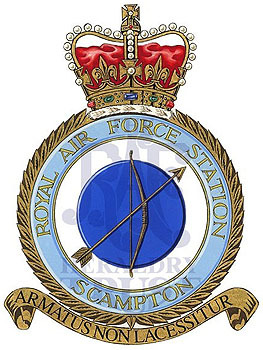 Link: The hurt symbolises the RAF with the other components forming a topographical representation of the station. The arrow is the lengthened runway, the bow-string the old course of Watling Street which passed the station and the bow the re-alignment of the road necessitated by the runway extension. History: Opened Jan 1916. Current. Sponsored by the Hon. Geoffrey J Beck Esq., Lord of Knowle, and dedicated to the bomber crews of RAF Scampton, who flew from this base throughout WW II. Many failed to return; they will never be forgotten.